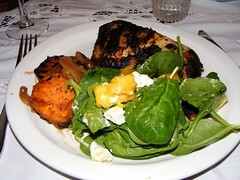 This dish is inspired by Mimi’s lunch the other day at Maye River Grille in Bluffton SC. We were graciously treated to lunch by my friend Doug and we all enjoyed our selections thoroughly. Mimi ordered the catfish and I thought to myself “I can do that.” So tonight, that’s just what I did. I seasoned the catfish with chili powder, old bay and paprika – also a dash of salt and pepper. I added the filets to a hot skillet and cooked for about 3 minutes per side. 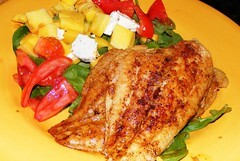 I served the catfish over a bed of wilted spinach with a side of mangos, tomatoes and goat cheese. YUM. Too bad Mimi wasn’t over tonight to give her opinion, but I tasted her lunch and I think my version was every bit as good as theirs. I would like to clarify a few terms used in Diane’s last post. When we say “Cavalcade of Fun,” what we really mean is lying around on the couch watching tennis, or lying around on the couch watching “Friends” reruns, or lying around on the couch waiting to find out if the baseball game has been rained out. I just didn’t want people thinking we were out doing productive things. We avoid that whenever possible- at least I do. But hey- I’m on vacation. Admitedly, Mimi and I have been slack as the cavalcade of fun has overtaken the time that we would normally spend cooking. We do have a project on the horizon. We received an offer from Country Bob to try his special sauce free and then blog about it. We got 2 bottles and we are in the process of planning our use for the sauce. I think Mimi has decided on pork and I have decided on chicken so stay tuned for that exciting cook-off. We’ll be sure to have lots of pics of the process – so just hang tight – we’ll eventually pull ourselves away from televised coverage of Wimbledon and get back into the kitchen. Well, the cavalvade of fun part ? I can’t remember what part – maybe 3, who’s counting, got into full swing yesterday when Mimi and I finally got back in the kitchen together. We didn’t plan this meal in advance, just used what was around the house, but we created a pretty great pizza. I still had some of the steelhead trout in the freezer so I took that out to thaw. I also have a basil plant taking over my front porch – so we put our heads together and came up with this pizza. It was great! 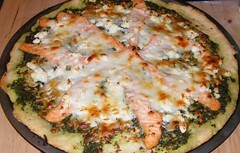 Seriously good flavors here – the moral – don’t be afraid to put fish on a pizza 🙂 We made a simple pesto and then just started layering the toppings – we got artsy with the fish and made a pinwheel design 🙂 from the thinly sliced trout. 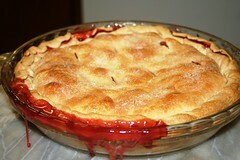 The dough was a very simple dough that you don’t have to let rise at all and its very easy to work with. Well after bruised thumbs and broken eggs, fathers day dinner turned out to be lovely. I marinated the chicken in a very basic way – just salt, pepper and paprika and then I rubbed them down with oilve oil – the sweet potato salad was really good, but missing something I couldn’t quite put my finger on – Mom suggested it was maybe cinnamon (I’ll try it next time) – anyway – it was pretty easy – I sliced a large sweet onion and carmelized it in pan with a bit of olive oil – when the onions are tender and brown add about a 1/4 cup of balsamic vinegar and a heaping tablespoon of dijon mustard and let it heat through – remove from the heat and add a heaping tablespoon of honey – and set the whole thing aside to cool. Slice 3 sweet potatoes in 1/2 inch medallions – sprinkle each side with salt and pepper and brush with olive oil; grill for about 3-4 minutes per side (just throw it on with the chicken) and then add to the onion mixture. (Yum). You’ve already read about the key lime pie and I will admit – even though I am in particular hurry to squeeze that many key limes again – it was the best key lime pie I have had in recent memory. If you saw my previous post you know already that I got a stash of key limes from the farmers market. I decided to make a key lime pie for father’s day. Let me say that this didn’t seem out of the realm of possiblity. If you don’t know anything about key limes, they are delicious tart little things and when I say little, I mean little. So juicing them is no fun at all, especially if, like me, you don’t have a juicer. Now I had a big pile of limes and intended to make 2 pies, one for father’s day, one for book club since you only need 1/2 cup of the juice…that was pie in the sky (forgive the pun.) I only got 1/2 cup from the whole batch! How do you get eggs out of a woven carpet? I’ll let you know if/when I do. I finally got the pie in the oven and its cooling in the fridge until I go to my parents house – It darn-tooten better be the best darn key lime pie ever….stay tuned.